Discussion in 'OS X Mavericks (10.9)' started by gmansmg, Oct 6, 2013. Hy, I have just installed Mavericks GM on my Macbook Air 2013 and I am experiencing some battery issues. It was a clean install, not an upgrade. I heard a lot of people asking about the 2013 MBA with mavericks regarding battery life, but honestly it doesn't seem an improvement atm. Right now my laptop is fully charged and it shows about 8 hours of battery life remaining. 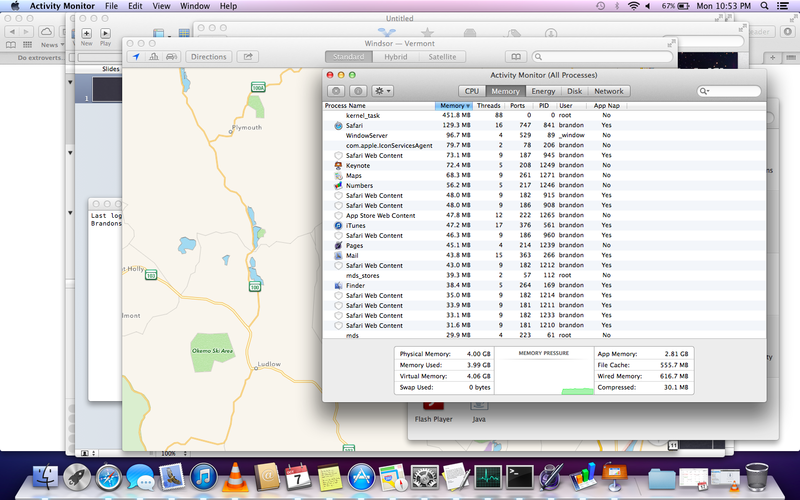 That is very weird, since it used to show 12 hours on Mountain Lion. I was expecting a big (not huge) improvement with the timer coalescing feature and am now a bit disappointed. I will perform a reinstall soon to check if the issues stick, but still, i find it very weird. the battery life on my macbook pro (late 2011; 13") was about 7h with ML. now it went down to 4:30h. I tend to leave E-Mail open all the time. It seems though that it's using quite a lot of CPU. After I left it closed the battery life improved dramatically. Showing 7hrs on my MBP 2011. But, as we all should know, that is subject to change, depending on usage. This may have been your case: Usually after an OS install/update, Spotlight will (partially) reindex itself, causing a significant increase in CPU usage. This may have been the cause of the shorter "% battery left". Wait for a couple of hours and it'll go back to normal. What he said. After an OS install the system will perform various processes to optimize the system. This will cause a spike in CPU usage from time to time over the first few hours. Once they are completed the battery life will return to normal. Battery calibration takes a while to settle in too. I'm seeing longer life. Maybe a half an hour or longer. Haven't measured it. Hello again and thanks for the replies! I have performed another clean install sunday afternoon. Installed all the apps (the same ones i used on ML) and updated everything. Then i left the laptop plugged for a few hours, to check the reindexing issues. But then again, i still have lower battery life calculated by OS X Mavericks. I will do a full battery cycle today and see if that helps. I am not a heavy user on my MBA, the e-mail is not always open, i mostly use it for browsing. Streaming movies online on 10.9 was more of a battery drainer than on 10.8. I will keep testing this issue and perhaps when the OS will be launched officially, things will look brighter. Now i have 96% on the battery and it shows 10:41 hrs remaining. I have 9gag, Facebook and 2 other websites open + writing this post, and it doesn't feel right. At 96 percent i had 11-12hrs on 10.8. I was expecting at least a 10-20% increase in battery life due to the new features of os x mavericks. Did you actually get 11-12 hours real usage? Perhaps mavericks estimates are more realistic? Yes, the mba 2013 battery life is insane. I am starting to believe that the estimates shown by mavericks aren't quite as accurate until a battery calibration. I mean i have fully charged the laptop yesterday evening (20 hrs ago) and never plugged it in since. I started using it 11 hours ago, in the morning. At first it showed 7-8 hours left, but i have used it all day, not heavy load, that i do on my work laptop, but browsing mostly, updates, some streaming, apps installing/uninstalling. and after about 7-9 hours of usage, i am (shockingly) at 56% (with 7 hrs remaining). So i am beginning to think that even though the estimate might not be very accurate, the battery life is indeed improving with 10.9. Wish there were an application that would monitor battery life precisely. I mean from plug out to plug in. Have you tried resetting PRAM? +1. I got 4.5 hours, approx. a 30 minute improvement over Mountain Lion. I've got a failing battery (cheaper out like an idiot) and Mavericks has gotten me roughly another 45 minutes of battery life. Will we see this drastic increase in the new rMBP? Battery life seems pretty similar here with a has well mba 13 inch. I was already getting a good 12 hrs in ML though. MV is much more responsive than ML though. Same thing here. No big difference compared with ML. Just upgraded this morning and left plugged for the afternoon. Right now, battery is still 100% and showing 6:26 remaining. Worse, memory usage was higher than ML. With only Chrome, Mail, iBook running, Swap is already in use. Kernel task uses more 700M. I can't get it to use swap opening pretty much every app on my system, that sounds abnormal. For me battery life has been similar is not slightly better than ML (it was already very good in ML on my air). Memory usage has been much better, especially safari. My system often used swap in ML (4gb ram), but on Mavericks I never see it touch swap, the memory management as a whole seems hugely improved and my system always stays responsive. I've been using my air for like 5 hours already on battery today, and currently at 65% battery estimated 9:30 left. Hy again! I have just plugged the mba 2013 in after 30 hours (13-15 of usage) and i was at 20% with 2:30 hrs remaining. Hopefully this will recalibrate the battery and the indicators will be right. Flash seems to be using a great deal of battery, streaming and vpn too. We still have to wait for all the applications to be updated for 10.9, and perhaps then things will be even better. Fingers crossed mavericks will live up to our expectations. how do you get that graph? Sadly, i don't get any graph. I monitored it myself (why there aren't any apps that can record all the battery statistics, including per-app consumption percentages, it's beyond my knowledge). okie. but a user posted the graph. and coconut battery just gives the health and battery timings. and no stats.